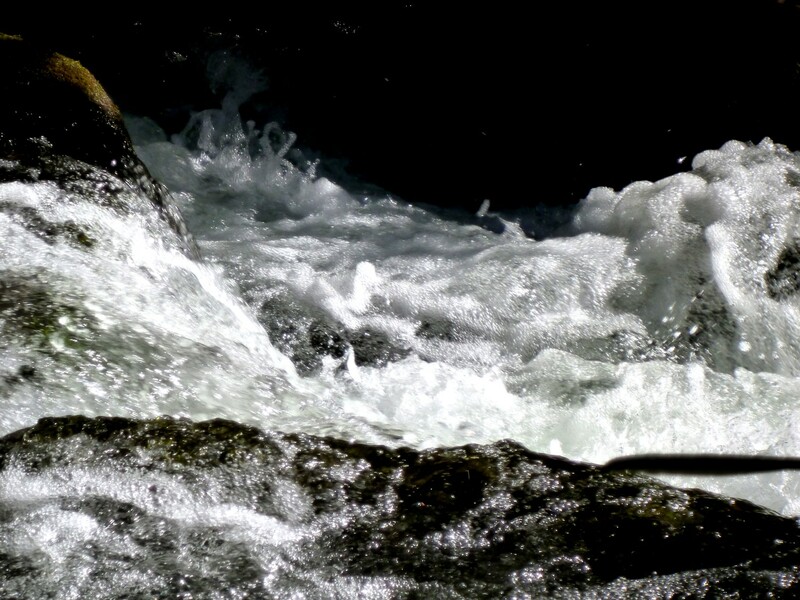 Posted by Jenny in nature, photography, Smoky Mountains. 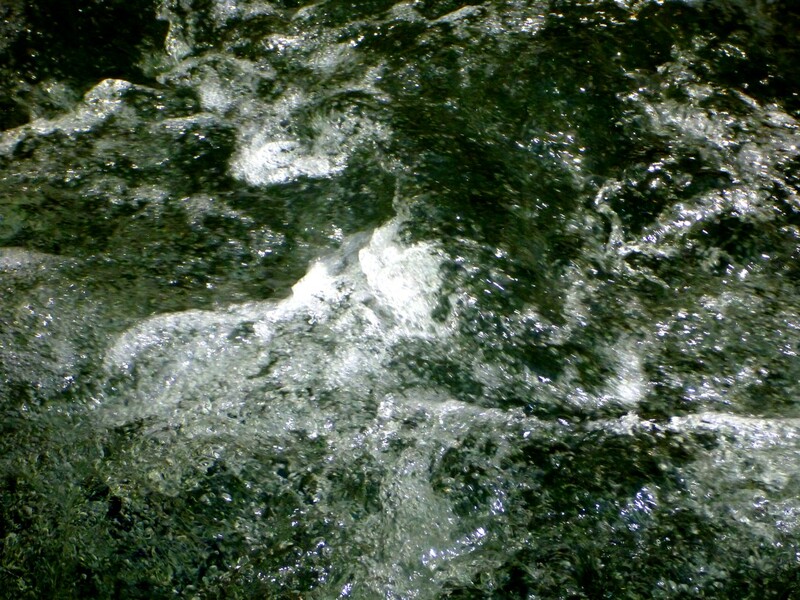 Click for zoom on any photo if you would like to see the microcosm of the stream. On my road trip in August, I traveled a short distance on the Lincoln Highway when I drove west from Gettysburg. I crossed the dramatic Tuscarora Summit and departed the famous highway when I turned south on US 522 at McConnellsburg. At a stop later that day at the visitor center at Sidelong Hill in western Maryland, I learned just enough about US 30—the Lincoln Highway—to whet my curiosity. I’m glad that my experience with the Lincoln Highway began in the Gettysburg/Chambersburg area, with its deep, momentous Civil War associations. In the following I’ll touch on a few points of interest across Pennsylvania, but I can’t come close to a detailed description of the highway in this state. Take the selection below as one person’s idiosyncratic view of a vast subject. Our last visit to the Highway saw us departing New Jersey on the “Trenton Makes” bridge over the Delaware to arrive at Morrisville, PA. The route of the Highway was adjusted many times between 1913 and 1930, but the final alignment had it going along US 1 to Philadelphia. The entire Lincoln Highway in Pennsylvania had been designated PA Route 1 in 1924; two years later, the route from West Virginia to Philadelphia became US 30 and the stretch from there to New Jersey became US 1. 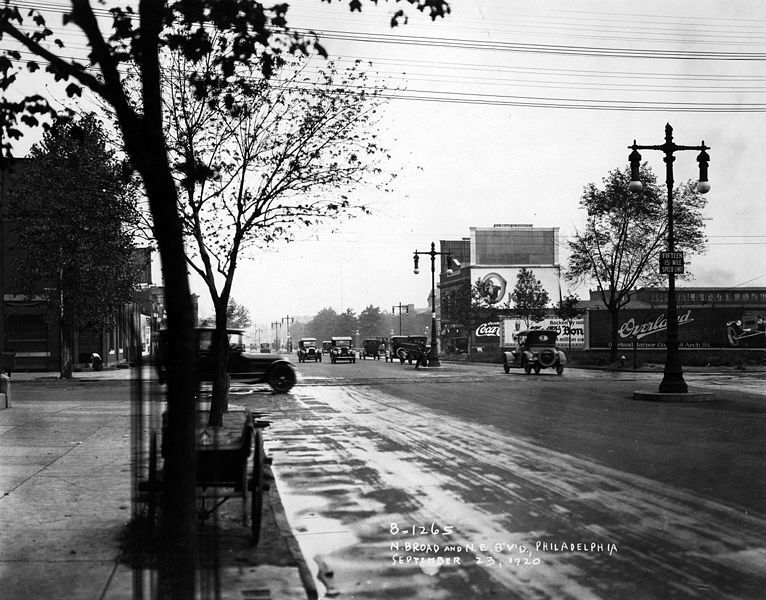 In its present incarnation, the Lincoln Highway through Philadelphia is a complicated, high-speed journey using interstates and expressways. Things were different in the early days. 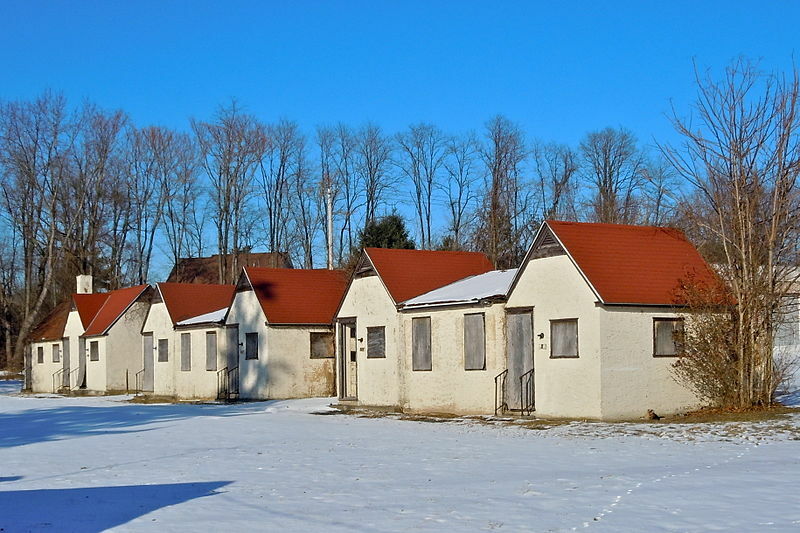 Breaking free of Philly, the Highway travels through Exton, where the boarded-up Williams Deluxe Cabins speak of the end of an era. My family stayed in cabins like this when I was growing up. As a child, I felt there was something wonderful about having an individual miniature home instead of a unit glued together with many others. It was like having a cupcake instead of a piece of cake. 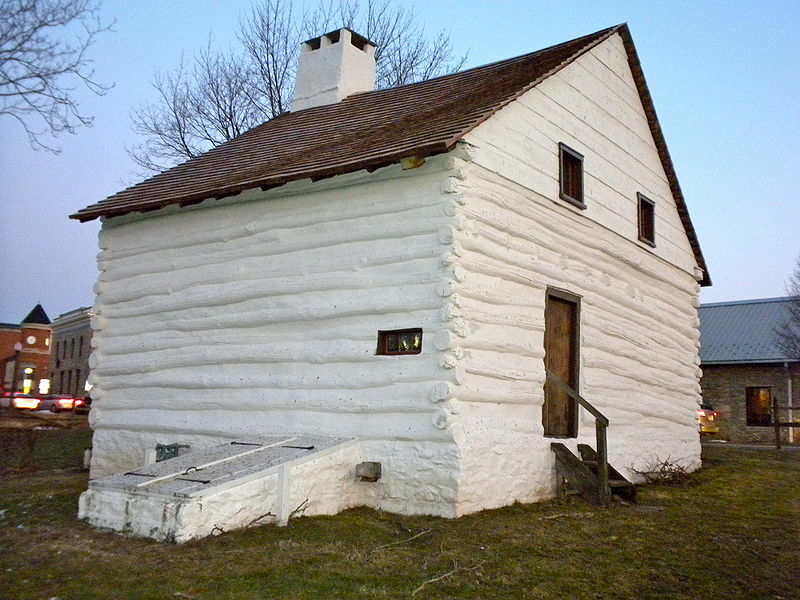 The Highway passes through Downington, where one can see the Log House on Brandywine Creek. It was built around 1701. The white paint makes it look like a ghost of its former self. 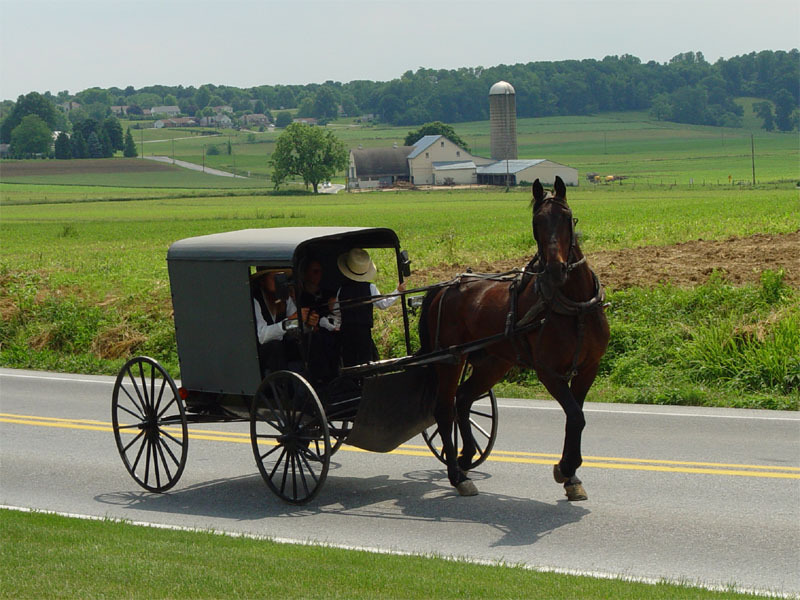 The Highway continues into Lancaster County—Amish country. 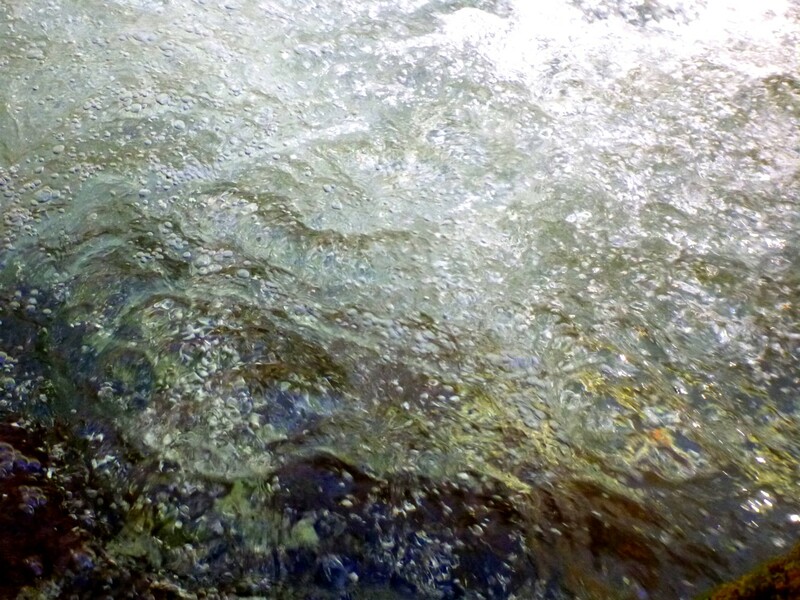 There one can see two worlds in collision. On my road trip, I found myself in a line of traffic behind a Mennonite buggy in West Tennessee (on US 64 east of Savannah). I wondered how it feels to be in that buggy with automobiles racing past whenever they have a chance to get by. I suppose the occupants get used to it after a while. The Highway crosses the mighty Susquehanna at Columbia and passes the Shoe House in Hellam. Starting in the 1920s and continuing for several decades, there was a craze for oversized buildings in the shape of everyday objects. 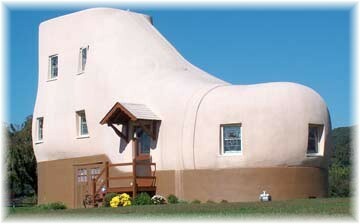 Many have disappeared or fallen into disrepair, but the Shoe House has been lovingly maintained. Built by “Colonel” Mahlon N. Haines in 1948, it is 48 feet long and 25 feet high. Haines, the “Shoe Wizard of York,” was renowned for his dominance in shoe sales throughout central Pennsylvania. The antics of today’s used car dealers pale by comparison with his advertising gimmicks. When he first built the Shoe House, he invited elderly couples to stay for a free weekend that included the services of a cook and chauffeur—a great publicity stunt. Later, honeymooners from any town with a Haines shoe store were invited to stay. Haines believed that as long as he could attract plenty of attention, people would buy his shoes. The Highway passes through York and reaches Gettysburg. Could one find any greater contrast than between the Shoe House and the famous battlefield? And yet, oddly enough, a theme of shoes continues, as we will see. 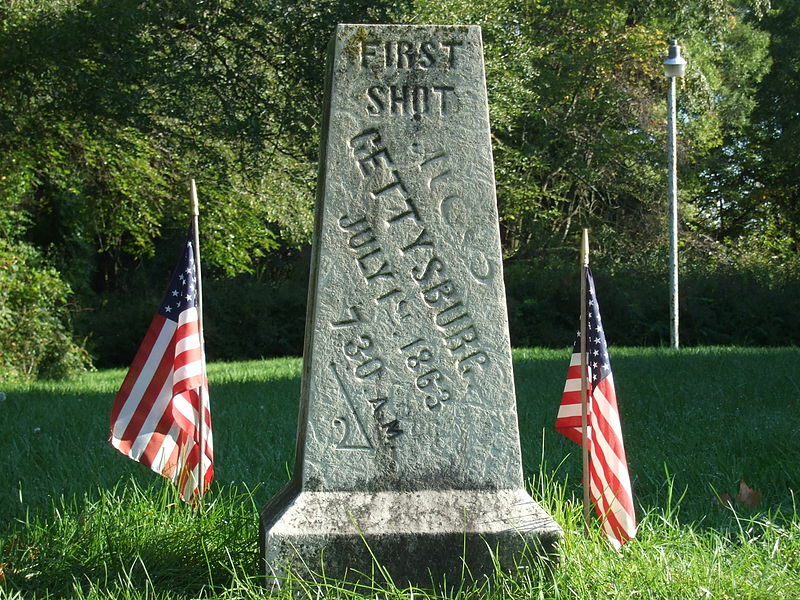 US 30 passes through the center of the town of Gettysburg and follows the route of the Chambersburg Turnpike, the scene of the first action of the battle, July 1, 1863. The Confederates were approaching from Chambersburg, and Union forces arranged themselves in defensive positions along ridges west of town. The day before, Maj. Gen. Henry Heth of the Confederates had sent men under Brig. Gen. J. Johnston Pettigrew toward the town to look for supplies—especially shoes. Pettigrew spotted Union cavalry under Brig. Gen. John Buford and turned back to report this to Heth. However, Heth insisted on believing these were only Pennsylvania militia, not a substantial Union force. Early on the morning of the 1st, Heth’s division advanced in columns. Three miles west of town, at 7:30 a.m., Heth’s forward brigades made contact with Union troops. According to legend, Union soldier Lt. Marcellus Jones was the first to fire a shot. All the shooting would end with a Union victory July 3 at a cost of 50,000 casualties between the armies. Twenty-five miles to the west of Gettysburg, the Lincoln Highway passes through Chambersburg, which was invaded several times by Confederate forces during the war. In the third and last invasion, July 1864, troops under Brig. Gen. John McCausland burned down a large portion of the town for failing to provide a ransom of $500,000 in US currency. Union men soon made “Remember Chambersburg” a battle cry. We leave Civil War landmarks behind as we travel west of Chambersburg. 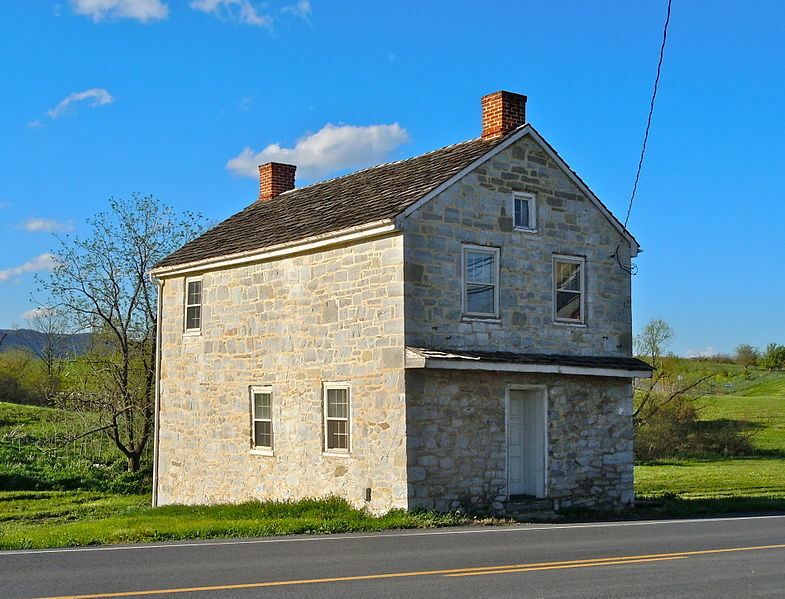 Near St. Thomas, the Highway passes a historic tollhouse from the old Chambersburg-Bedford Turnpike. It dates to the early 19th century. 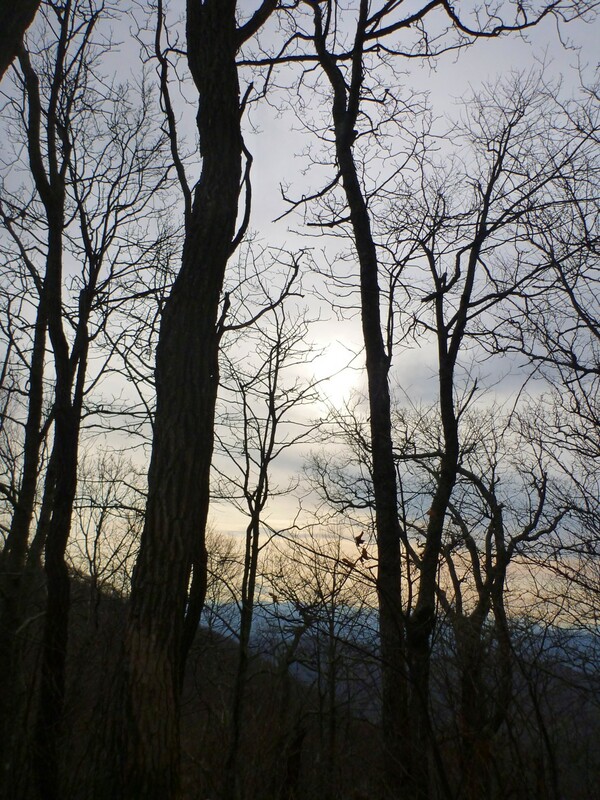 The Highway makes a steep, winding climb over the Tuscarora Summit, elev. 2240′. Early travelers were advised to make sure their automobiles were in good condition, “especially the brakes.” For an excellent compilation of period postcards with commentary, visit this site, which covers the Lincoln Highway both east and west of this lofty point. 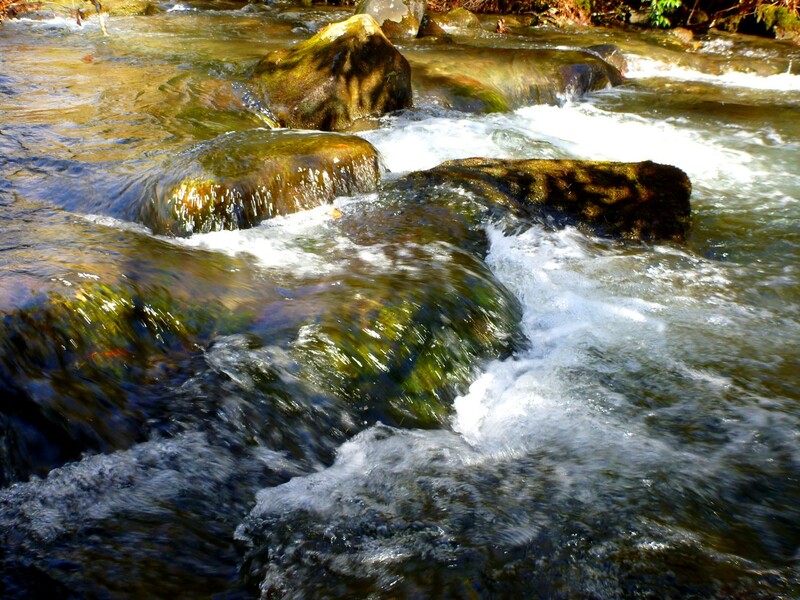 The Tuscarora name came from a people who migrated to this area from North Carolina following wars of the early 18th century. 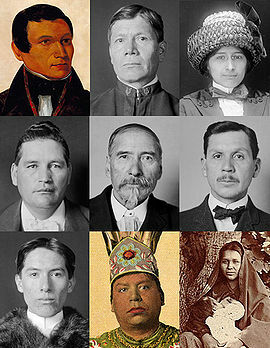 The Tuscarora belong to the Iroquoian-language group. They now inhabit mainly upstate New York, Ontario, and eastern North Carolina, but only the tribes in the first two areas are recognized by their respective national governments. The Highway around Bedford boasts several points of interest. 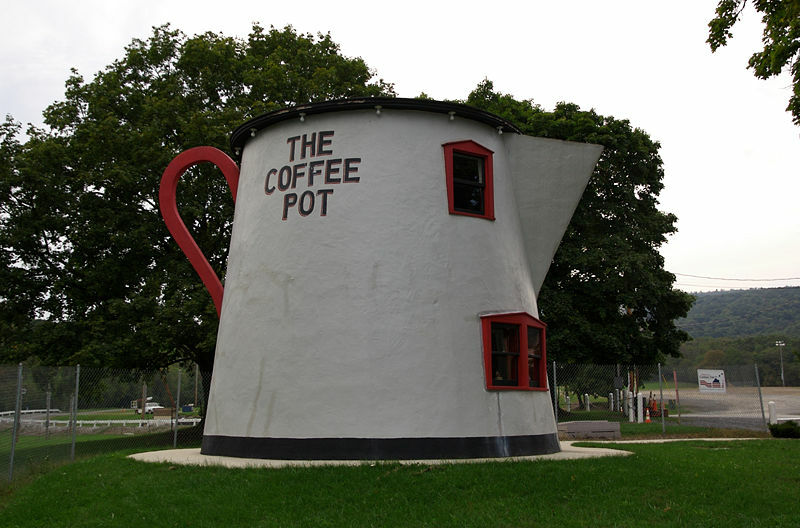 They include the Coffee Pot Restaurant (see photo at top), built in 1927 by Bert Koontz to attract visitors to his nearby gas station. It served ice cream, hamburgers, and Coca-Cola, and became a regular stop for Greyhound bus passengers. It was moved to its present location and restored by the Lincoln Highway Heritage Corridor in 2004. 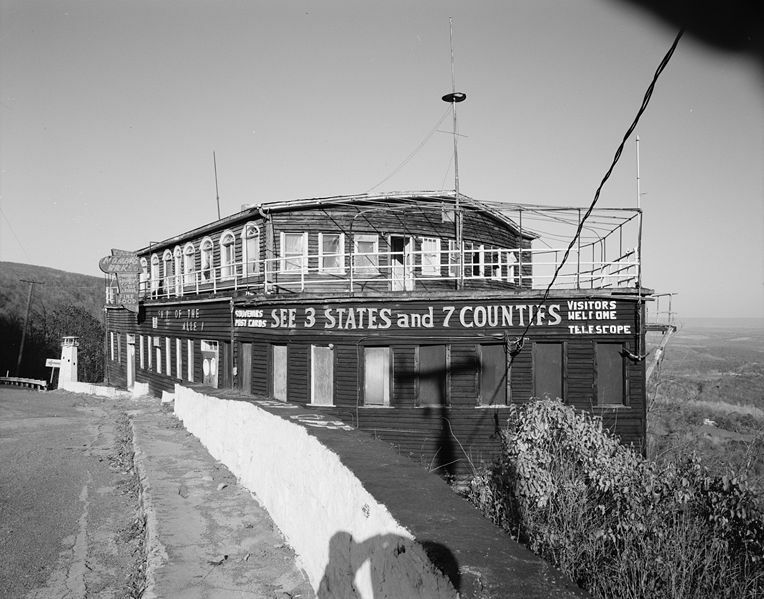 Formerly near Bedford, but destroyed by fire in 2001, was the Grand View Point Hotel. It was built in 1932. 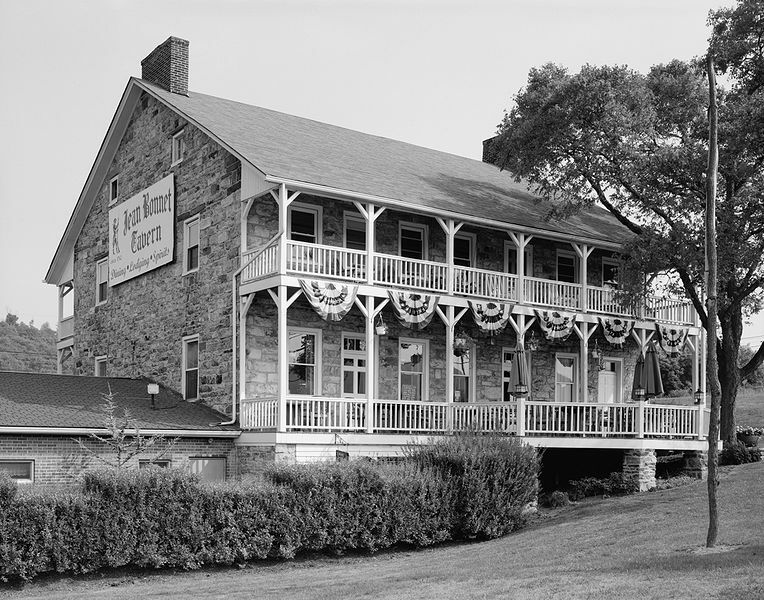 Still standing at 6048 Lincoln Highway is Bonnet’s Tavern, built in 1762. 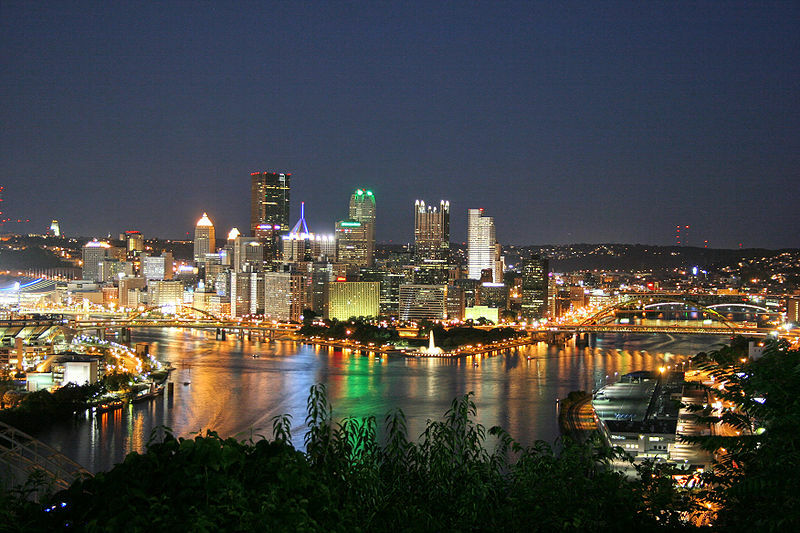 With apologies to readers in western Pennsylvania, we now pick up considerable speed as we cross a region that has no towns of any size until the greater Pittsburgh area. After crossing PA 160, it is possible to make a short side trip to the south to visit a temporary memorial to the victims of the United Flight 93 plane crash from 9/11. (The crash site itself, located nearby, is closed to all except families of the victims.) The crash occurred just west of Indian Lake and north of Shanksville. 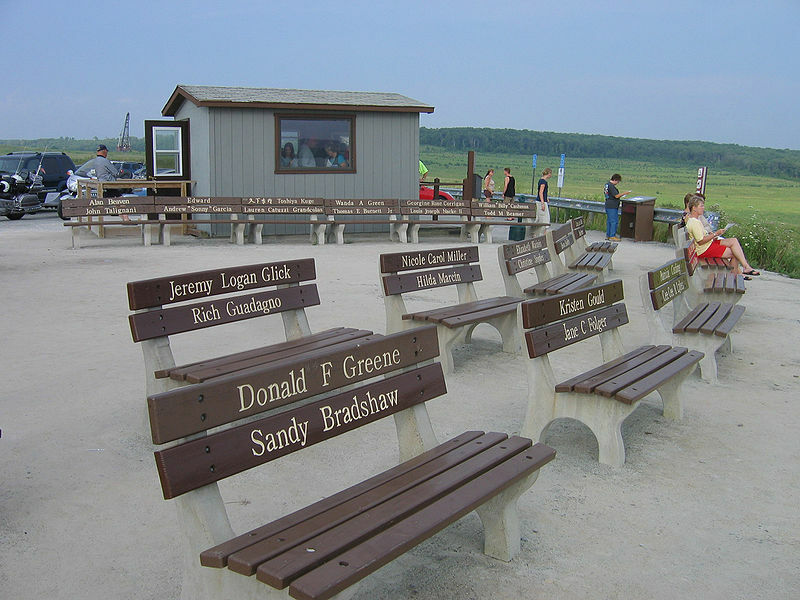 Temporary memorial for those who died in the Flight 93 plane crash. Funding is still being raised for a permanent memorial. Near Ligonier, we pass the Compass Inn Museum, located in a historic stagecoach stop built in 1799. This is all coal mining country from Somerset County onward, but Pennsylvania has fallen far in production from earlier days. It now accounts for just five percent of national output, behind Wyoming, Montana, West Virginia, and Kentucky. Many of the Pennsylvania bituminous mines (as opposed to anthracite in the Scranton/Wilkes-Barre area) fed the steel mills of Pittsburgh. And at last we approach that city and cross it on the Penn-Lincoln Parkway. US 30 joins I-376, then the four-lane US 22, before it recovers its identity near the town of Imperial. There we will angle northwest in our next post to make a very brief visit to West Virginia. Posted by Jenny in hiking, Mountains to Sea Trail. Note to Lincoln Highway followers: Pennsylvania coming soon! 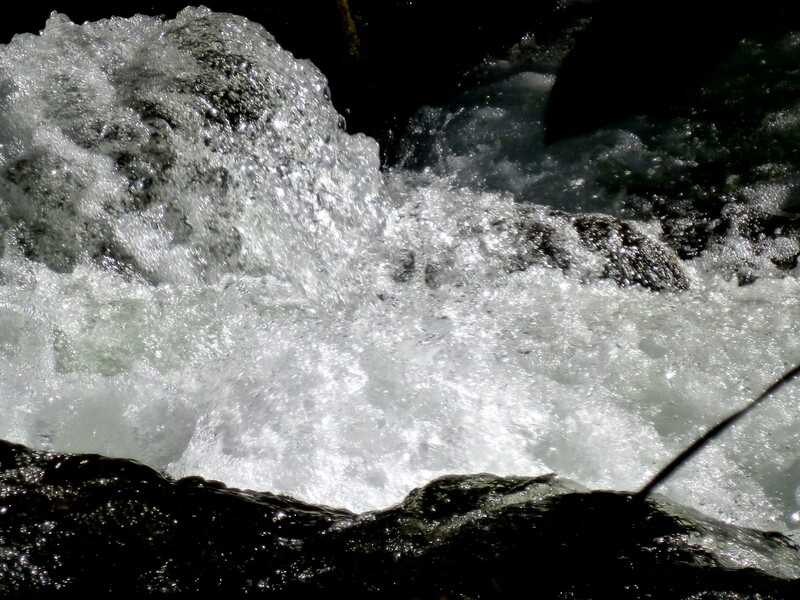 I was in the mood for a severe mountaineering challenge—but it had to be close to Asheville. Lane Pinnacle came to mind. Off I drove to the Blue Ridge Parkway, only to find it was gated! A strange thing on this afternoon of temperatures in the 60s. 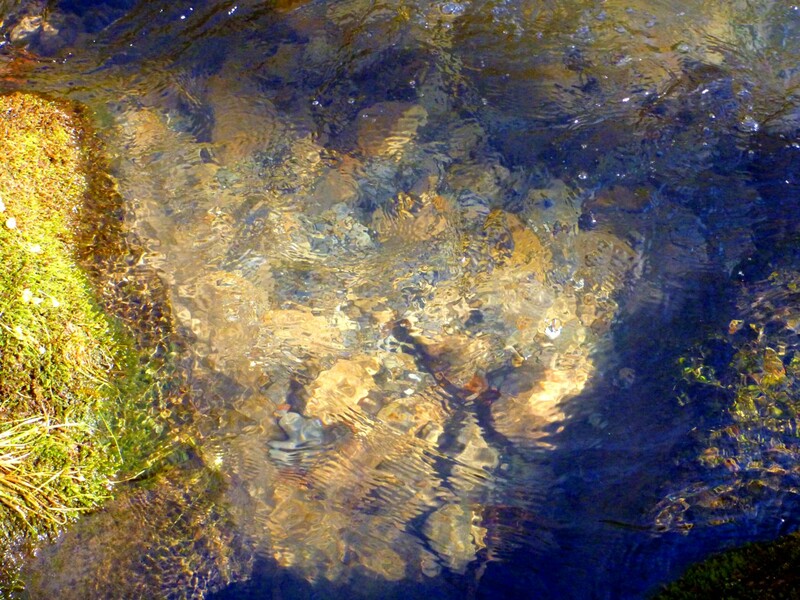 There must have been ice in the Craggies left over from Thursday’s cold snap. Reluctantly I turned around and drove the short distance down the Ox Creek Road to a trailhead I’d visited only two days before with my friend Beth. It’s the most popular approach to Rattlesnake Lodge. I would push through the Lodge area and make an assault on Rich Knob. At just shy of 4900′, it would at least give me 1700′ of elevation gain and six miles total. Twenty minutes into the hike, the roar of motorcycles told me the gate had just been opened. Oh well! I was committed to my quest. I climbed the steeper of the two paths up to the spring, then continued to the gap that I will always think of as the “white beebalm gap.” That got me up to 4400′. Then came the moderately steep switchbacking section that leads to Rich Knob. 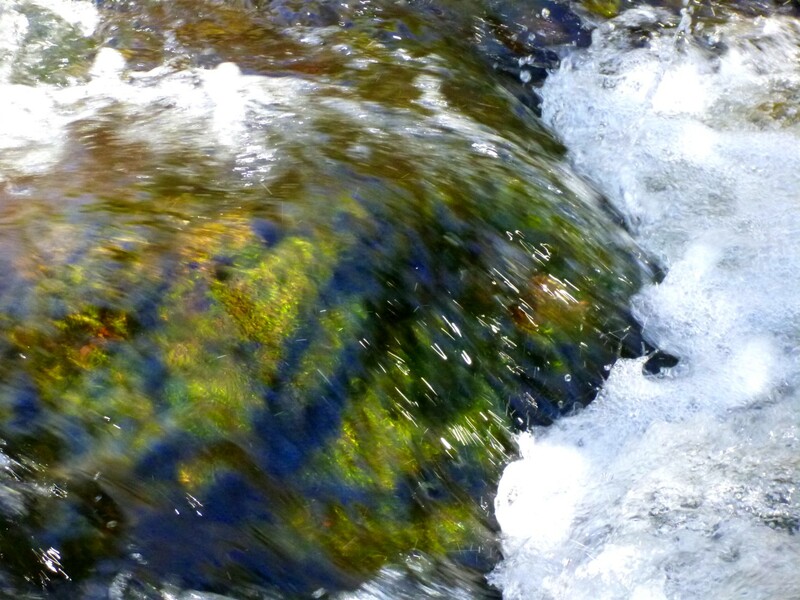 I passed under the overhanging boulder—covered with rock tripe—that shelters a permanent campfire ring. At last I reached the summit area. 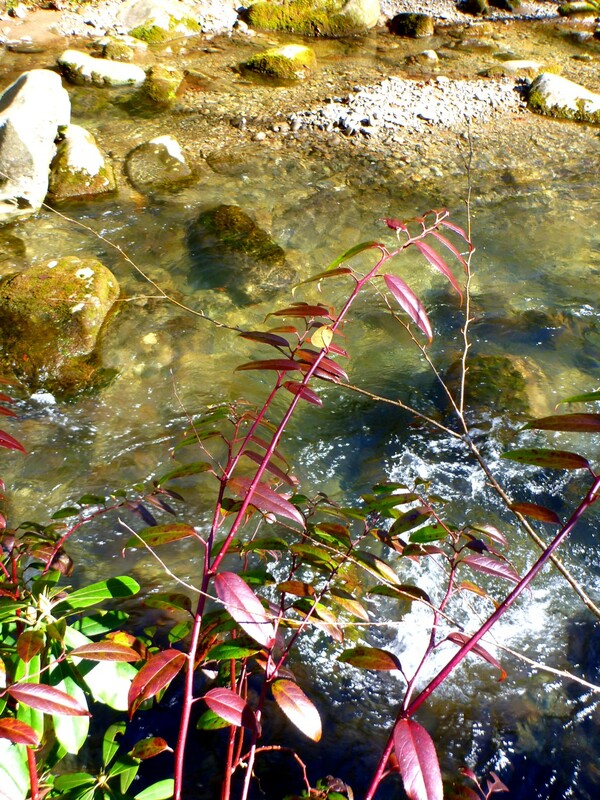 The MST trail doesn’t go over the true summit, and I knew that this time I must face up to it. 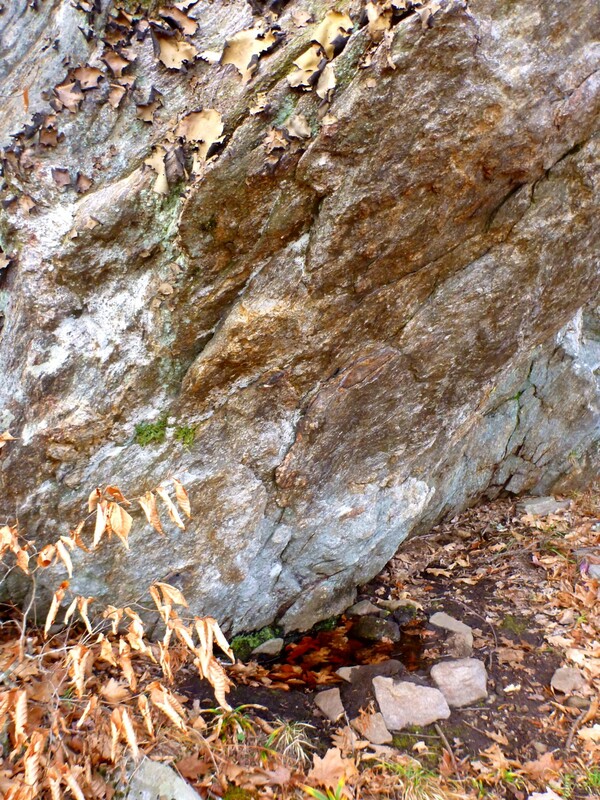 I tackled a forbidding cliff that towered over me, striking fear deep into my heart (see photo at top). 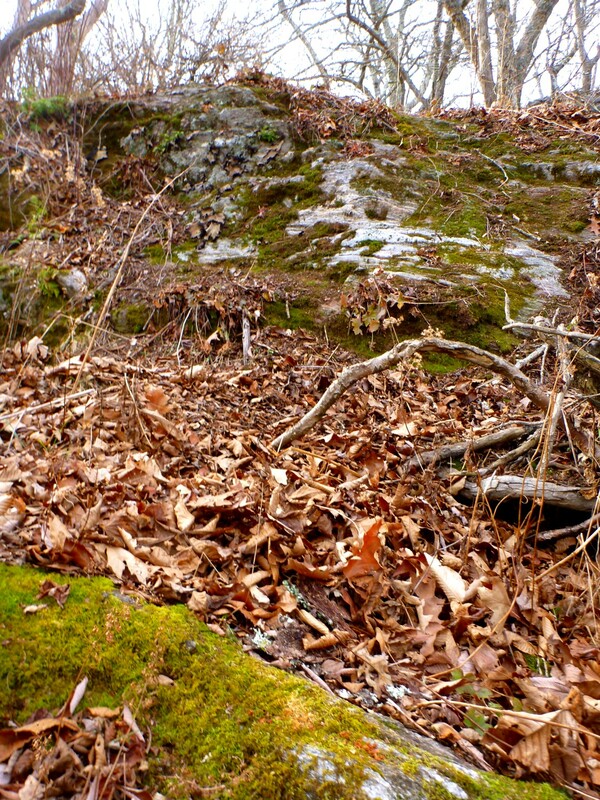 Above this obstacle, I discovered that the summit was surprisingly ornery. 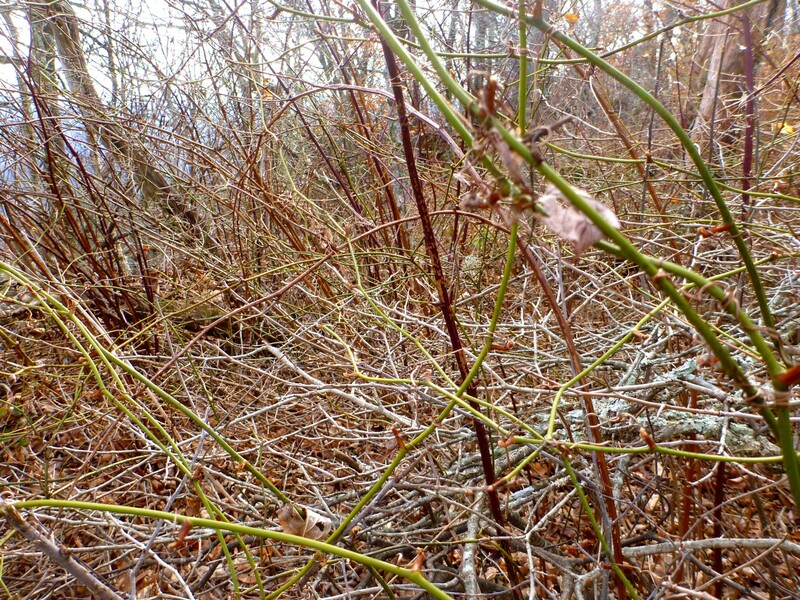 As a result, I have to admit there might have been a lump or a bump slightly higher than where I was standing, but I decided not to fight through the briers. This is November, when you have to look for small things. 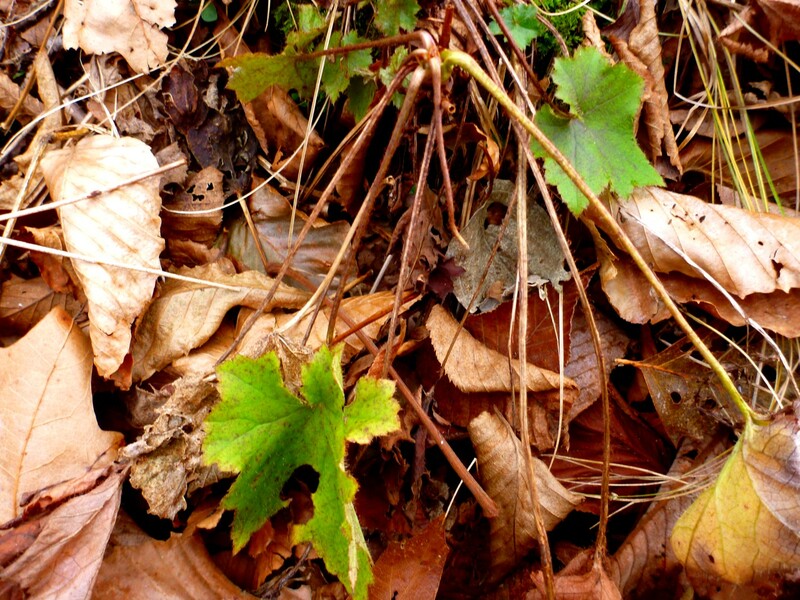 The fall leaves have turned brittle and brown, the bright frosts of winter have yet to come, spring hides around the other side of the circle (I think of the calendar year as a giant circle, with winter at the bottom), and summer is but the faintest glimmer. I discovered a geranium that I will have to check up on next June. 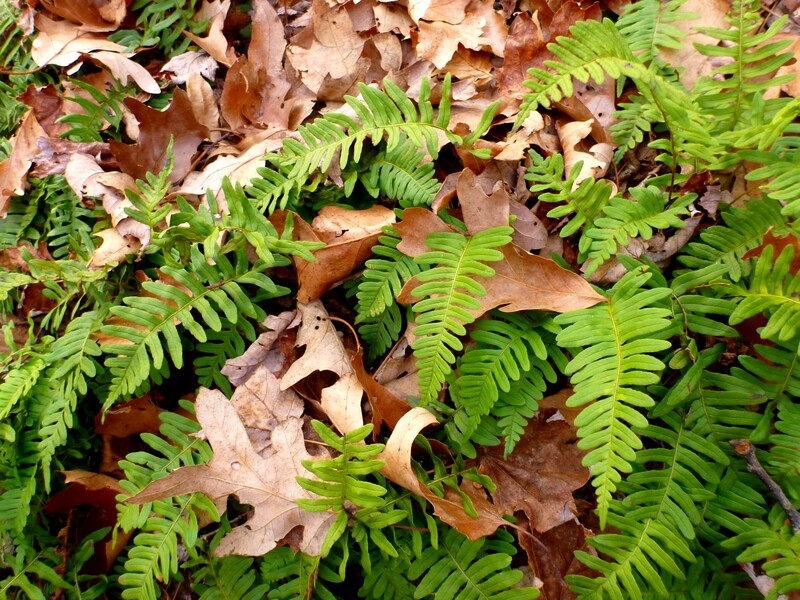 I always like Christmas ferns with their persistent green and their tidily stenciled shapes. 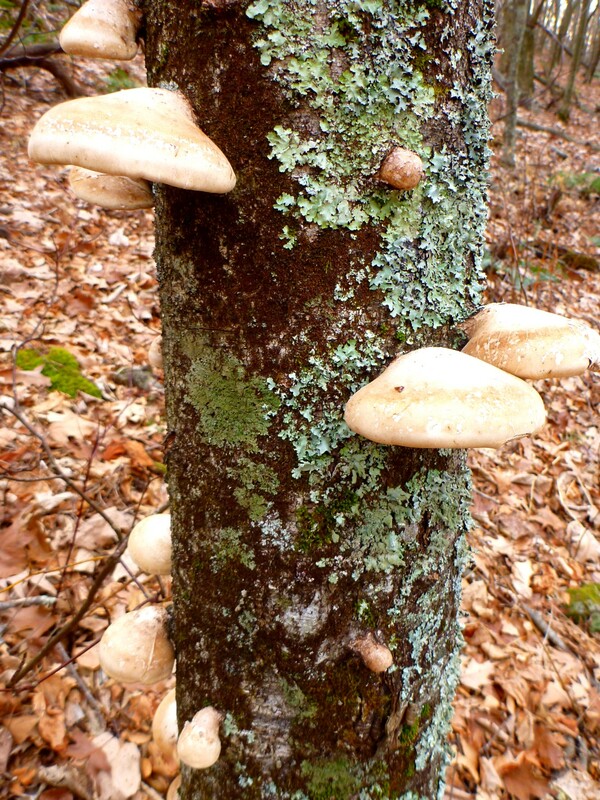 The forest here leans heavily to oak. I could smell oak in the air (which got my allergies going), and I slipped and slithered on the leathery oak leaves going down the ankle-deep trail. As I headed back down, things already looked dark. Time to enjoy the twinkling of holiday lights!